If you want to test your water for usability prior to making colloidal silver, this is the unit for you. It will read microsiemens (uS/cm) which is a measure of conductivity. If your water measures less than 2 uS it is acceptable for CS production. As an additional benefit, this instrument can closely relate the reading to parts per million (PPM) of ionic/colloidal silver after you have produced it. If the water was pure to start with, this meter will read colloidal silver directly in ppm by applying a correction factor. We have tested our colloidal silver for ppm using the atomic absorption method and this meter reads those samples within a close percent of the laboratory results. We supply instructions with the proper correction factor so you will be able to easily calculate your PPM (parts per million) of ionic-colloidal silver. This instrument is very simple to use. It is manufactured by Hanna Instruments, a leader in electronic measurement equipment. Just insert it into your distilled water and it will read directly in uS (micro siemens). It is temperature compensated and is accurate to within 2 percent (of full scale). When testing ionic/colloidal silver water the reading is in PPM. The range is 0-99.9 uS/cm or 0-99.9 PPM. The PWT (Pure Water Tester) comes with batteries which will provide approximately 150 hours of continuous use. This unit sells for $68.00 (factory price). We also have standard calibration solutions so you can make sure your meter is always reading correctly. A 230 ml bottle sells for $13.00. If ordered with the tester, the solution is shipped free. We STRONGLY recommend you purchase calibrating solution because the instrument does require recalibration when first used and from time to time. The factory includes a small screwdriver in each box so you can perform the calibration very easily. All you need is a small glass vessel to hold the solution while the meter is inserted in the solution. This unit is warranted to be trouble free for 1 year. We are the west coast distributor for the Hanna Instruments PWT meter. Dealer inquiries are invited. We can also provide all Hanna Instruments equipment at the factory price. We are a factory authorized Hanna Instruments dealer. 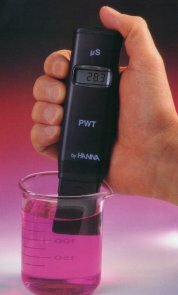 There are several companies selling other Hanna instruments they indicate will test colloidal silver but were really designed to measure TDS (total dissolved solids). As calibrated from the factory the TDS meters will normally read only about one half the PPM of ionic silver that the PWT meter will read. Most of the Hanna TDS instruments have ranges of 0-999 PPM or 0-1999 with 2% accuracy of full scale. That means the unit can be off by as much as 20 or 40 PPM at the low OR high end of the range or at any reading. If you are trying to measure colloidal silver at the 5-15 PPM range, it is obvious that a 20 or 40 PPM possible error is not acceptable especially if the reading is only half the actual amount of silver in the water. The PWT will not be off more than 2 PPM so you can see how much more accurate it is. The PWT meter is the only meter that works at the accuracy and range desired to measure CS. All other dealers we have observed selling these units are also inflating their prices above factory prices because they are not Hanna dealers or are trying to make extra profit. Check with us before you spend your money on another unit touted as being useful for checking colloidal silver. The PWT is the only meter that works well for this purpose and at the right price.